Is your dog easily distracted? Is he more interested in other dogs and people than in working with you? Does he get overly excited in certain situations? Does he spend time sniffing the floor when you want to train? If the answer to any of these questions is “Yes” then working on focus, attention-paying and impulse control will help. In fact, I would go so far as to say that everything else you try to train is much more difficult than it needs to be. Spending some time and effort on these exercises will pay off by making all your future training easier. Even dogs with lots of training experience would still benefit from improved focus and impulse control. The exercises are appropriate for dogs in various dog sports such as agility, obedience and field trials as well as helping your dog become a more responsive and focused household companion. Step 1: First of all decide what your criteria is. If you haven’t done this exercise before, you will probably be rewarding a momentary glance in your direction. Start by attracting the dog’s attention with a kissy noise or a click of the tongue. Or, just stand still and wait for the dog to look at you. As the dog looks at you, CLICK! And feed 5 or 6 treats in quick succession, one at a time.. Then, toss the 7th treat on to the ground so that he has to unfocus to get it. We are doing this so as to give the dog an opportunity to re-focus on you – or find your face. As soon as he looks at you again, reinforce with the click and treat, treat, treat, 6 times. Again, toss the 7th treat on the ground. Repeat this exercise 2 or 3 times. It is very important that no coercion is used for this exercise – no leash jerks or calling the dog’s name. As the dog’s focus improves, gradually increase the length of time between reinforcements. This behaviour must be a default behaviour – in other words, no cue. Practise this two or three times a day for two or three minutes at a stretch. One of the times could be before you give him his dinner. Leave the bowl on a table, and wait for him to focus on you before giving him his dinner. Step 2: When your dog is able to sustain the looking at you for 5 seconds, you can raise your criteria again by only clicking for eye contact. You will probably have noticed that in the previous step the dog did make eye contact every now and again. In Step 2, you will only be clicking and treating the glances where your dog made eye contact. Step 3: Show the dog you have some really nice treat (a Beeno) or a favourite toy in your hand, then hold the toy or treat out to the side at shoulder height. If your dog starts jumping towards your hand, simply put it behind your back. As soon as your dog stops jumping, bring the toy out again and hold it at shoulder height. 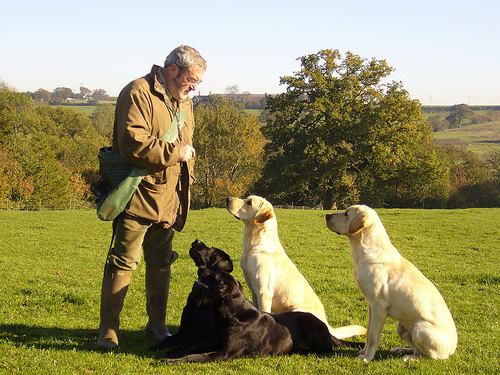 If your dog is sitting calmly, simply wait for him to glance in your direction. Click and give him a treat from the other hand. The toy goes away behind your back. The point of this game is that the more your dog ignores the toy or treat in your hand, the more likely it is that he will get a click and a treat. Repeat this a couple of times, and for the final successful attempt, let him have the treat or toy in your hand. You need to use up at least 10 to 15 treats with each session and you should try and have at least two or three sessions a day. This exercise, apart from teaching your dog the cue “Leave” (that dead frog on the ground – or the cake on the table – or the food in a toddler’s hand) also teaches him about self-control. Step 1: Show the dog a treat, then fold the treat into your hand so it’s totally protected. There must be no part of the treat available to a questing tongue or prying teeth. Put your hand down in front of her at mouth height. Note that your hand protecting the treat is a fist. This fist will be the dog’s first CUE. The fist cue says “Keep away from my hand.” Later you can change the cue if you want to by associating a word like “Leave” with the presentation of the fist. Trying to protect the treat by holding it up above the dog’s head, or jerking it out of her reach as she approaches it, are common mistakes. Holding it up high will only encourage her to jump up to get it, and jerking it away from her will force her to grab at it to try to get it away from you. You’re already protecting it by holding it in your closed fist. Let the dog figure out how to get that treat out of your quiet hand. The minute she gets tired trying to get the treat from your fist and moves her nose away, you click and open your hand so that the treat drops on to the floor. As she takes the dropped treat, you can say “Take It”. You can also feed her with the other hand, but don’t confuse her by feeding her with the hand that’s protecting the treat. You’ll know that she’s grasped the concept when she pointedly ignores your fist when you put it in front of her nose. Adding the Cue: Once she’s realised that ignoring the treat makes you click you can start associating the word “Leave” with the presentation of your fist. You can also at this stage move on to the next step. Step 2: As you present your fist, say “Leave” and open your hand so that the treat is visible. 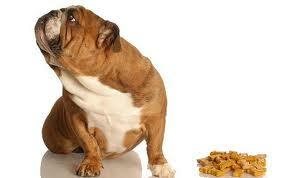 If your dog doesn’t grab the treat, click and drop the treat on to the ground. If she does make as though she’s going to grab it, quickly protect it by closing your fist over it. Say “Leave” once more and open your fist. In all likelihood she will ignore the food, in which case you can drop it on the floor and cue “Take It”. Step 3: What you’ll probably find is that with each repetition her “staying away” is getting harder, faster, longer. You can now start raising criteria by either gradually increasing time or distance. Be careful not to start raising criteria until you get at least 8 successes out of 10 trials. Step 4: When you’ve got some decent time and some decent distance, find a convenient coffee table. Show the treat to the dog, put the treat on the coffee table, and cover it with your hand. If you think this is going to be easy, think again. Staying away from your hand is NOT the same thing as staying away from the coffee table. You might have to go back to the beginning or on the other hand, she will catch on immediately. Both are normal. Once she’s decided that this is the same exercise as the one she did with your fist, she will move her nose away from your hand. Click and flick the treat onto the floor, saying “Take It”. When she’s made the connection move your hand away from the treat. Of course, when you move your hand off it, she’s going to grab for it, so be ready to cover it again. Click and flick it off the table when she’s staying away from it. When you can lean back and leave the treat alone, with the dog holding back waiting for you to click and flick it off the table, add your cue as you’re placing the treat on the table. There’s no need to bellow “LEAVE!” simply use a normal quiet tone. This is a useful exercise to teach your dog whenever you are going through a doorway or gate or exiting your car in a strange place. In a nutshell, what you are going to teach your dog is to stay put until you are given permission to go, and when out or through, reorient to you until you release him. This is NOT a rank reduction exercise. I honestly don’t care if the dog goes through a doorway before me or not, but what I’m trying to guard against is for the dog to leap out of my car when the door is open directly into oncoming traffic, or to charge out of my gate and leap onto a passerby to say “Hi”! I also do not want to constantly be telling my dog to sit and stay, stay, STAY while I concentrate on getting my parcels out of the car before he runs amok. Any gateway or doorway will do for the purpose of this exercise. Step 1: The door does not open until the dog is sitting. The “sit” must be a default. A default behavior is a behavior that has been rewarded many times in the past, and is the behavior a dog falls back on when it’s not sure what you as the owner want it to do. You have just arrived at some place that the dog enjoys and that is safe – either home at dinnertime, or the dog park or some other safe area. He is dying to get out of the car so is standing on the seat tail wagging furiously. You, on the other hand, are just standing calmly – waiting. Because something good usually happens when your dog sits down, he will try this. You immediately put your hand on the car door handle. 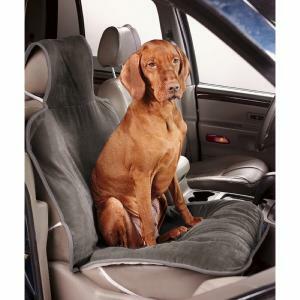 Your dog’s rear end immediately comes off the seat – poised to leap out. Your hand comes off the handle. You continue in this fashion until the dog has realized that the only way to get the door to open is to sit and wait. You have not said anything at all. 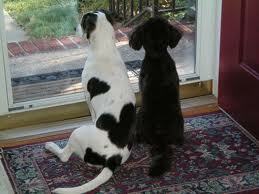 All you have done is to watch for the sit, and open the door (or start opening it) when your dog sits. If the dog will stay sitting until the door is fully open (you may block the opening with your body, but do not SAY anything) reward your dog by allowing him out. Note: The default may be lying down That is fine – just be consistent. Step 2: Reorienting to you once he is out. Once your dog has learnt that he needs to stay sitting until you cue him to get out of the car, then you need to teach him that getting out doesn’t mean that he can dash off. He needs to know that reorienting to you is what is required. Have the lead on your dog before you leave home. By now he should be sitting when you open the car door. Take hold of the lead and invite him out. When he gets to the end of the leash, he should turn around and look at you. Click and treat. A couple of times before releasing him. Use the same methods to teach your dog self-control at gates and at doorways.